This toolkit is designed to help facilitators, event organizers, and those who want to spark conversation in their community around sustainable development. This is by no means an exhaustive list of all the kinds of mapping you can do, but a list of some ways we’ve found useful and productive to spark conversations in communities all over the world. If one methodology feels like it could help, feel free to edit it for your context, and use it in any way. We’d suggest sending these questions to your participants to potentially try mapping their community before coming to a training so that conversations can begin as informed as possible, though this is also an exercise that works well in groups at trainings, too. In all cases, try to track resources from their very beginning to the very end of their lives — where do they originate, how are they used, where does the resource end up after use? Show how much of a resource goes in which direction at each step by using larger or thinner lines. Be clear whether you are tracking resources for your school, your community, your whole city, or your country. If doing it at any medium to large scale, be clear whether you are looking at households, businesses, agriculture, etc. Farms and factories use water and energy very differently than households. If group members are from different communities with different resource systems, feel free to encourage them to draw a combined system. 1) Identify and draw where water in your neighborhood comes from at the very beginning. This may be outside of your city or town: from a mountain stream, a river, harvest rainwater, a well, a pump in a lake, and more. If you have multiple sources of water, draw the lines connecting source to use as bigger or smaller based on how much of your water comes from where. 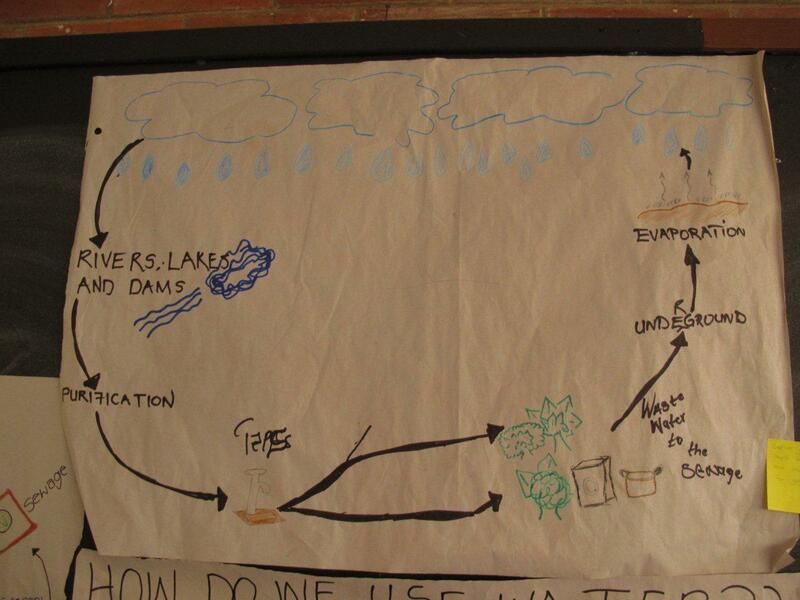 2) Identify and draw how water comes to your neighborhood. Is it via pipes, waterways, aqueducts, rivers, or people carrying it? Identify and draw how water gets to where you use it (your house or school). Is it from a faucet, a public pipe, buckets, or pumped houses? 3) Identify and draw how you use water. Include all the ways you use water: drinking, cooking, washing, laundry, cleaning, painting, and more. 4) Identify and draw where water goes once you’ve used it (besides into your body!) Does it go down a drain, into a bucket, onto the street, into a plant, or where? 5) From that drain, bucket, or pipe, where does that water go? How does it end up back in nature? Does it end up in a river, in a field, in a garden, in a wastewater treatment facility? Track it as far down as you can, until it ends up in the sea or in the soil! 6) Discuss how the water system impacts your community. Do you think this system will stay the same in the future? How would it change with more or less rain, hotter days, and more people? How could you use less water? How could you manage waste water more effectively? 7) What is the future you want of this water system? What about water systems in other places? 2) Identify and draw how it turns into the form you use it. Do you burn wood to cook? Does a turbine convert a river into hydro-electricity? Does a powerplant convert coal to power? 3) Identify and draw how that energy reaches you: through wires or the electricity grid? 4) Identify and draw how you use energy. Include if relevant, but don’t limit yourself to, lighting, appliances, heating, cooking, and more. 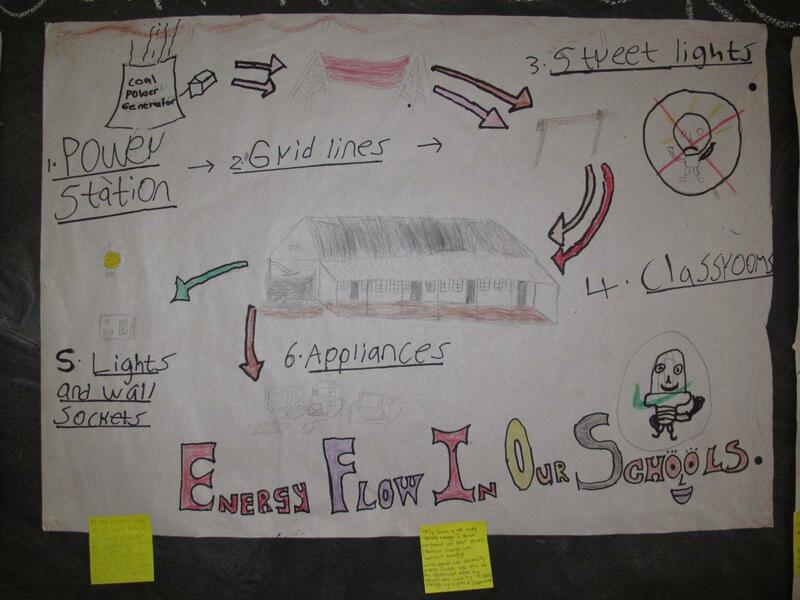 5) Discuss how you generate and use energy and how it affects the community. Will it stay the same in the future? How would this change with hotter days, more or less rain, and more people? Are there ways you could use less energy? Are there ways you could generate more energy from clean sources? 1) Identify and draw the stuff you use every day. Think about all the products and items you use, from your toothbrush to your cooking goods. Try to draw the ones you use most often bigger than the ones you use less frequently. 2) Identify and draw where you put things you’re done with. Do you give them somewhere when you’re done? Where do you throw things away? Do you separate them? Where and how? 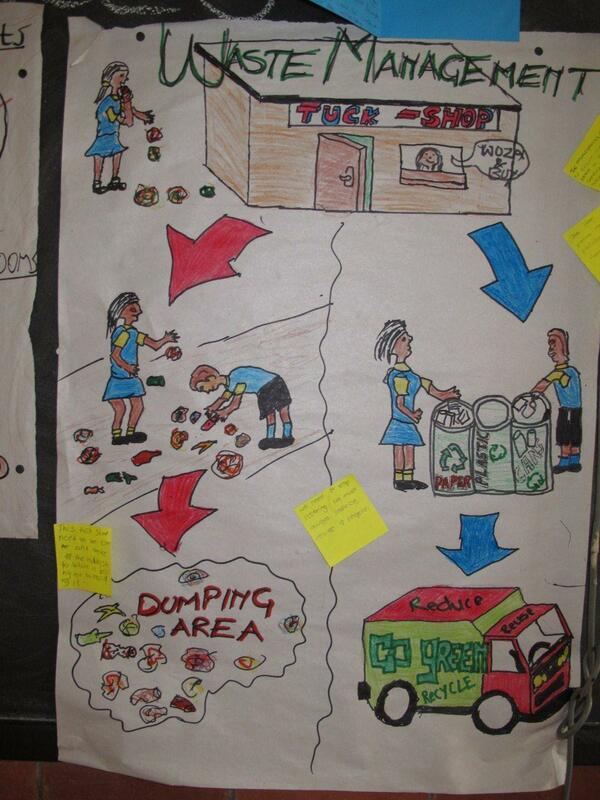 4) Discuss where your waste goes and how it affects your community. Will this system stay the same in the future? How would it change with more people? Is it fair that certain wastes end up in certain areas? What is the biggest source of your waste? How could that change? How could the way it is managed change? 1) On an existing map of your neighborhood, identify the transportation hubs (bus station, train station, taxi stand). 2) On an existing map of your neighborhood, color the streets differently based on how safe you feel, particularly in different kinds of transportation. Is a street good for biking? Are there bike lanes? For walking during the day? For walking at night? 3) Label good places to borrow, buy, fix or park a bicycle. 4) Label places to park, borrow, buy, or fix a car or motorcycle. 5) Label places where you go most frequently. 6) Discuss how these differences make it harder or easier to use one form of transportation or another when you are going between these places. Which mode of transport is easiest across the whole city? Which areas are missing one form of transport or another? Why don’t you feel safe riding a bike or walking down some streets? How could that change? any other green sites that are relevant. Discuss how the things you have labelled affect your community. Do you think this system will stay the same in the future? How would it change with more or less rain, hotter days, and more people? 1) Print out or draw a large community map, including major streets and locations. 2) Think about the food that is available in your community. Get at least 50 each of five or six colors small multi-colored circular stickers. Identify each color with a different food category, such as: fresh local produce, fresh local meat and dairy, fresh food attained from outside your local area, packaged/prepared food, cooked meals (including restaurants and take/out), Choose what’s relevant for your community as the categories, connected to food and health. 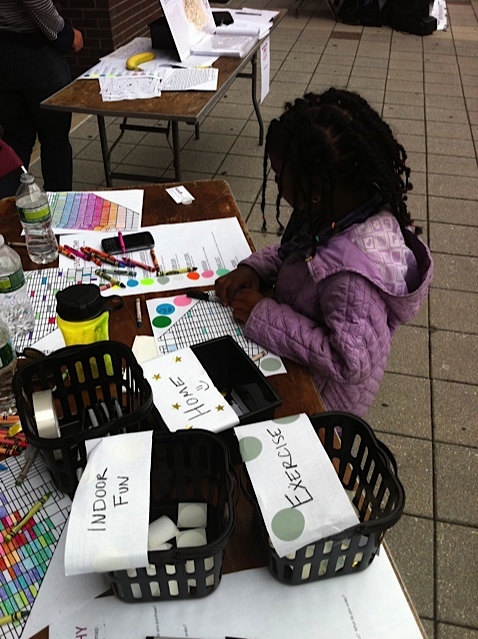 Also choose labels to identify open green spaces for exercise and play. 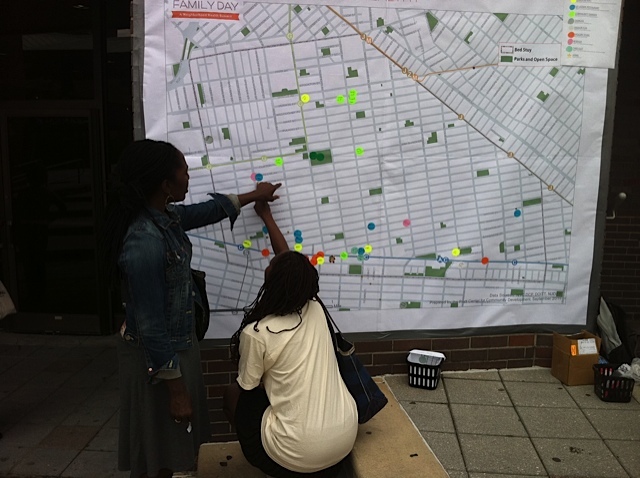 3) Invite community members to label the locations they use for gathering, purchasing and eating food. On the labels, identify what healthy food choices are made. 4) With a line or arrow, show where the food is coming from. Is it from your land? Is it from a local farm? Does it get shipped in from a different areas in your state/country? From another country? With different colors you can identify how sources change according to the seasons. 5) Discuss areas where healthy, fresh food is most and least available. How does that affect your health? Which areas have the most access to places to play and exercise? 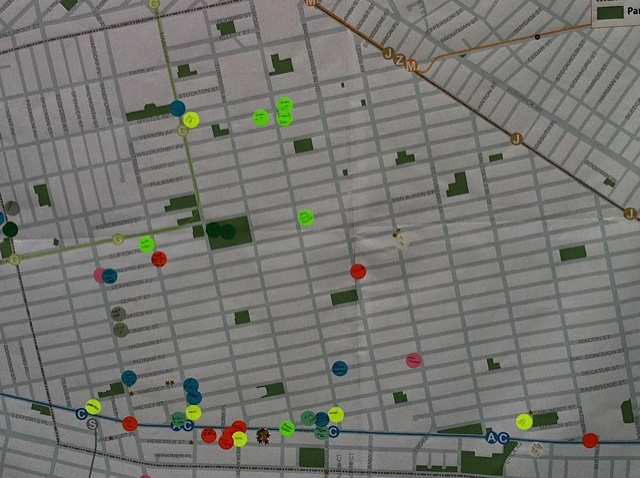 1) Draw or print a map of the community around your school. 6) What do you conclude from seeing your data in this way? What assets does your community have? Where are the spaces for greater sustainability? What can you do with this data? Gather some people and talk about how to make changes locally.